I have a tendency to change my mind about variable names as I write programs. However, changing the name of a variable which is used many times throughout a program can be a pain, since BASIC provides no command to do this for us, and there is no search-and-replace function. I wrote the Variable Name Table Editor to give me an easier way to change variable names. It reads the header and Variable Name Table (VNT) from a SAVEd file, allows each variable name to be edited, then writes a new file to disk. As an Atari BASIC program is entered, each text line we type with the BASIC editor goes through a process often called precompiling. BASIC converts the line into a tokenized format which can be interpreted during program execution much faster than the text line we enter could be interpreted. The tokenized version of the line is placed into the Statement Table (ST). Other tables are built during this pre-compile process: the Variable Name Table (VNT), the Variable Value Table (VVT), and the String/Array Table. If the line entered contains a new variable, its name is added to the VNT, and information about the variable is placed into the VVT. If the variable is a string or array, it is added to the String/Array Table. In the tokenized version of the program line, the variable is represented by a one-byte token. This value of this byte is the position of the variable in the VNT, plus 128 ($80). A BASIC program may have only 128 variables, and their tokens range sequentially from 128 to 255 ($80 to $FF). The VNT is maintained by BASIC for the convenience of the programmer. It is used only by the LIST statement. When the program, or a portion of it, is listed, the variable token is used as an index into the VNT and the variable name is displayed. The variable name may be any length. It must consist of uppercase letters and numbers and must begin with a letter. This gives us considerable freedom to use descriptive variable names so that our programs are easier to read. When a program is written to disk using the LIST command, the file is exactly the same as if the program is listed to the screen. When it is later entered with the ENTER command, BASIC pre-compiles each line and builds the various tables just as if it were being typed in. However, when a program is written to disk using the SAVE command, the file consists of a 14-byte header and the various tables that have been built. The Statement Table is saved in its tokenized format. When the file is later entered with the LOAD command, the header portion of the file is used by the operating system as an index to the various tables and the tables are simply read and placed into the appropriate place in RAM. While we are entering a program, if we change a variable's name, the new name is placed into the VNT. 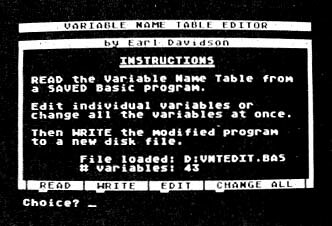 The original name remains in the table, even if it is no longer used by the program. The only way to clear the original name and free up RAM and variable space is to LIST the program to disk, type NEW, and ENTER it back into memory, which creates a new VNT using only the variable names encountered in the file. When VNT Editor is run, a menu of four items is presented: Read file, Write file, Edit Variable Names, and Change All. First you must read the file you wish to modify. When editing the variable names, you should be careful to use valid names if you wish to be able to edit the program later. Although BASIC places no restriction on the length of variable names, VNT Editor limits you to 30 characters per name which should be sufficient. Replacing a short name with a long one can also cause problems later if the new name results in program lines that are longer than the BASIC editor will accept. Once you have completed your changes, write the file out to a new filename. The new file may then be LOADed as usual. VNT Editor does not force you to use valid variable names nor does it check for duplicate names. There may be occasions where you do not wish to use valid names. If your program uses all of RAM and you need a few more bytes you might wish to change all variable names to one letter names. BASIC will allow only 26 (A to Z) and considers the dollar sign on strings and the parentheses on arrays as part of the variable name. The Change All option allows you to change all variables' names to the same one-character name,which could save you several hundred bytes in a large program. If you have a program which you do not want other users to modify for some reason, you may change variable names to special characters. The resulting file will run properly, but if a line containing an invalid variable name is edited, an error will result which cannot be corrected. Try changing all variable names to a string of 30 question marks. The resulting file will run correctly, but when LISTed, will appear very strange. If you create a file with invalid or duplicate variable names, be sure to keep a copy of your original file for future use. VNT Editor is straightforward, with no tricks or complicated routines. Remarks are not referenced, so you may omit them if you like. The Read File routine begins on Line 810. Line 830 reads the 14 -byte header for the file. Line 840 checks the first two bytes. They should both be decimal zero if the file is a SAVEd BASIC program. The third and fourth bytes contain an offset (from zero) from the end of the header to the beginning of the VNT+256. VNTSTART is set to this value in Line 850. The offset to the end of the VNT is one less than the start of the VVT. Line 860 assigns this value to VNTEND. The seventh and eighth bytes of the header contain the offset to the beginning of the VVT+256. VNTSTART is set to this value in Line 870. The offset to the end of the VVT is one less than the start of the ST. Line 880 assigns this value to VNTEND. The ninth and tenth bytes contain the offset to the beginning of the ST+256. Line 890 assigns this value to STSTART. The 13th and 14th bytes contain the offset to the end of the ST+256. Line 900 assigns this value to STEND. The fifth, sixth, 11th and 12th bytes of the header are not used by BASIC or VNT Editor. The VNT, as determined by VNTSTART AND VNTEND, is read and placed in the string VNT$. The length of VNT$ is stored in VNTLEN1 for use later. After editing the variable names, a new file is written by the routine beginning at Line 1010. Line 1040 checks to insure the destination filename is not the same as the source filename. The current length of VNT$ is stored in VNTLEN2 in Line 1060, and the difference between VNTLEN1 and VNTLEN2 is stored in CHANGE in Line 1070. The offsets found in HEADER$ are updated by the value of CHANGE in Lines 1080-1160. Line 1180 writes the HEADER$ to the new file. Line 1190 writes the new VNT$ to the new file. Line 1210 reads the old header and VNT from the old file and discards them. Line 1230 is a loop which reads a byte from the old file and writes it to the new file until the end of the old file is reached. Other sections of the program should be self-explanatory. VNT Editor will provide you with a new way to view and manipulate the VNT of your BASIC programs. The extra control and flexibility will be convenient on many programs and could be very helpful on larger programs using a large number of variables. Earl Davidson has been an avid Atari enthusiast for marry years. He is an active member of the Atari Users Group of Albany, GA, and as one of the owners of SoSoft, he wrote the user's manual for InSyst!, a small business inventory program for 8-bit Ataris. GD 230 POSITION 2,21:? "ENTER FILESPEC: "
IZ 290 IF KEY=27 THEN CHNUM=0:WORKS="":? WJ 410 POSITION 1 2:? " ML 430 POSITION 1,18:? " GH 440 POSITION 1,19:? " LO 460 POSITION 2,20:? "Choice? NJ 610 POSITION 2,20:? "Edit variable #? SE 640 ? CHR$(253):POSITION 2,21:? " EH 650 TRAP 40000:POSITION 1,21:? " "
DK 820 SOURCE$=WORK$:POSITION 2,21:? " HT 1440 POSITION 1,2:? " GD 1460 POSITION 1,18:? " SH 1470 POSITION 1,19:? " rom":? "a SAVED Basic program." BI 1700 CLOSE #2:CLOSE #3:POSITION 2,22:? OX 1720 POSITION 2,22:? CHR$(253);"
ZM 1730 P05ITION 2,22:? CHRS(253);"
RM 1740 POSITION 2,22:? CHRS(253);"